Big'n, in the 90s was one of the most important ref. for Chicago Noise Rock with The Jesus Lizard, Shellac. All their records have been published by Skin Graft Records and recorded by Steve Albini. Bign is a noise-rock band from Chicago, Illinois, who formed in 1990, consisting of William Akins, Brian Wnukowski, Fred Popolo and Todd Johnson. After releasing their debut self-titled single in 1990 on Headstagger Records, the band went on to cut its teeth on an impressively unhinged sound. Bign would go on to record a handful of singles and 2 LPs for legendary labels Skin Graft and Gasoline Boost, as well as a track for a 4-way vinyl tribute to AC/DC, which also included Shellac, Brice-Glace and U.S. Maple, before disbanding in 1997.The group was reignited in 2011 by releasing a compilation of 7"s and unreleased songs as well as a new 10" record on Africantape. In 2013, Fred Popolo took over bass duties - a no-brainer since he and Brian Wnukowski had been playing together in Haymarket Riot since 2004.In their subsequent work, Bign combines a Midwestern rock sensibility with a more embittered, dark and anti-ideological edge than the rest of their influences. 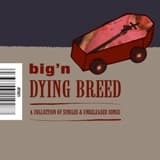 Lyrically, the songs of Bign run the gamut of depression, cursed love, the burden of life, parental preachings and, of course, the inevitable deathwish. Any fans of Jesus Lizard, Slint, Tortoise or Dazzling Killmen would be advised to apply within. 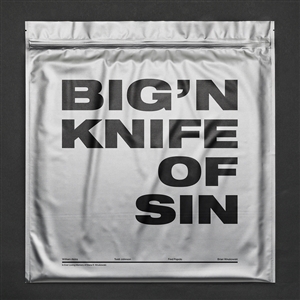 Their slashing, burning latest juggernaut of an EP, Knife of Sin, continues their abrasive, bruising sound to even more uncompromising ends.Knife of Sin was recorded by Steve Albini and Greg Norman at Electrical Audio in Chicago and mastered by Carl Saff. It will be released November 16, 2018, in unique, futuristic aluminum packaging by Computer Students, a new imprint of North of the Internet, Inc.
Chicago's Big'n, best known for 1996's Discipline Through Sound (Skin Graft Records) and split releases with contemporaries Shellac and Oxes, is back.Experimental French label AfricanTape will be releasing "Spare the Horses" on 10" vinyl on May 2nd, 2011. The EP was recorded by Greg Norman at Chicago's Electrical Audio. 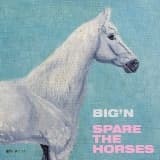 "Spare the Horses" features the uncompromising tracks "Assholes and Elbows," "Long Pig," "Like a Killer" and "Seaworthy.